The South Korean president said that joint work of Russia, South Korea and North Korea on projects in Russia's Far East will help to improve trilateral relations. VLADIVOSTOK (Sputnik) – South Korea, North Korea and Russia will work on joint projects in Russia's Far East region, South Korean President Moon Jae-in said Wednesday following his meeting with Russian President Vladimir Putin on the sidelines of the Eastern Economic Forum (EEF) in Vladivostok. 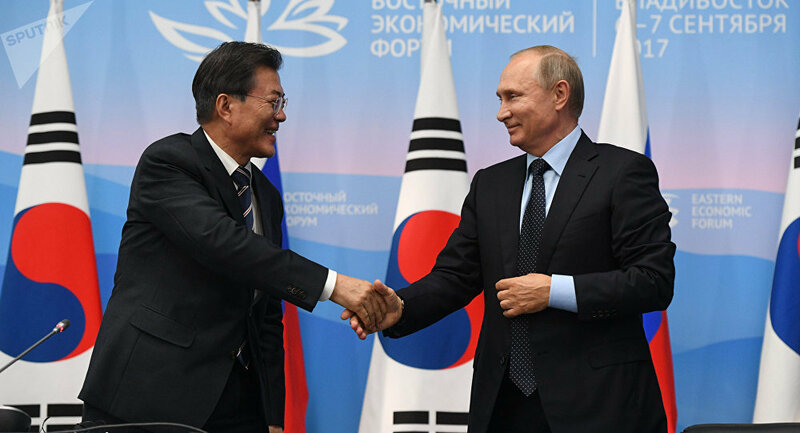 “President [Putin] and I agreed to boost the basis for the implementation of trilateral projects with the participation of both Koreas and Russia, joining the Korean peninsula and the [Russian] Far East,” Moon said. He noted that the projects had not been developed earlier for a number of reasons including the North Korean nuclear issue. “However, we decided to develop the projects that may be implemented in the near future, primarily the projects in the Far East. Development of the Far East will not only contribute to the prosperity of the two states but also to changes in North Korea, which will become a basis for trilateral relations,” the South Korean president said. He also said that Seoul and Moscow have agreed to create a working group on the possible signing of a free trade agreement between South Korea and the Eurasian Economic Union (EAEU). “[We] agreed to create a working group in order to hold negotiations on the possibility of signing this agreement,” Moon said, adding that the deal would boost cooperation between South Korea and Russia. The two-day EEF started in Vladivostok on Wednesday and is expected to gather over 3,500 participants from more than 50 countries. The forum is being attended by a number of world leaders including Putin, Moon, and Japanese Prime Minister Shinzo Abe. Rossiya Segodnya International Information Agency is a general media partner of the forum.